Milk Protein, Hydrolysed Gelatine, Glycerine, Palm Oil, White Chocolate Chips (9%) (Sugar, Cocoa Butter, Whole Milk Powder, Emulsifier (Soya Lecithin)), Soy Protein, Sugar, Reduced Fat Cocoa Powder, Oat flour, Gum Acacia, Raising Agent (Sodium Bicarbonate, Cream of Tartar), Flavouring, Salt, Sweetener (Sucralose). Milk Protein, Hydrolysed Gelatine, Glycerine, Palm Oil, White Chocolate Chips (8%) (Sugar, Cocoa Butter, Whole Milk Powder, Emulsifier (Soya Lecithin), Flavouring), Soy Protein, Sugar, Reduced Fat Cocoa Powder, Soy Protein Crispies (3%) (Soy Protein Isolate), Oat Flour, Gum Acacia, Raising Agent (Sodium Bicarbonate, Cream of Tartar), Flavouring, Salt, Sweetener (Sucralose). Milk Protein, Hydrolysed Gelatine, Glycerine, Palm Oil, Chocolate Chips (9%) (Cocoa Mass, Sugar, Emulsifier (Soya Lecithin)), Soy Protein, Sugar, Reduced Fat Cocoa Powder, Oat flour, Gum Acacia, Raising Agent (Sodium Bicarbonate, Cream of Tartar), Flavouring, Salt, Sweetener (Sucralose). Milk Protein, Hydrolysed Gelatine, Oats (15%) (Rolled Oats, Toasted Oats (Oat Flakes, Sugar, Palm Oil, Honey)), Glycerine, Palm Oil, Soy Protein, Raisins (6%), Raising Agents (Sodium Bicarbonate, Cream of Tartar), Flavouring, Spices (Nutmeg, Ginger), Sweetener (Sucralose). Milk Protein, Hydrolysed Gelatine, Glycerine, Palm Oil, White Chocolate Chips (9%) (Sugar, Cocoa Butter, Whole Milk Powder, Emulsifier (Soya Lecithin)), Soy Protein, Oat flour (Gluten), Sugar, Gum Acacia, Raising Agent (Sodium Bicarbonate, Cream of Tartar), Flavouring, Salt, Sweetener (Sucralose). Milk Protein, Hydrolysed Gelatine, Glycerine, Palm Oil, Soy protein, Chocolate Chips (6%) (Cocoa Mass, Sugar, Emulsifier (Soya Lecithin)), Sugar, Reduced Fat Cocoa Powder, Candied Orange Peel (3%) (Sugar, Orange Peel, Acidity Regulator (Citric Acid)), Oatflour (Gluten), Gum Acacia, Raising Agent (Sodium Bicarbonate, Cream of Tartar), Flavouring, Salt, Sweetener (Sucralose). The nutritional information is based on the Double Chocolate Chip Flavour version, when choosing an alternative flavour the nutritional values may vary. Really good source of protein and quality ingredients but could be a bit less sweet. Perfect preworkout snack espically when works been flat out having to skip lunch. Bought mutiple boxes, so far 4 flavours (chocolate, rocky road, cookies and cream, and just recently white chocolate almond). Everything tastes great except the white chocolate, tastes like medicine. Defintely a trick to turn you off having your next cheat meal. These taste delicious. 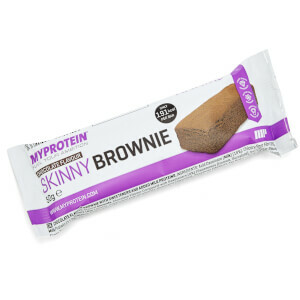 Love the macros for them and they are great on the go snack and especially post workout. Yet to find another that compares. Best Cookies on the market. Being someone who can't say no to a seductive looking cookie, I've have tried many of the "healthy", protein cookies on the market. All of them have been dry and flavourless, and require a mouthful of water with each bite to try and help stop the sensation of eating sawdust and plaster. Not any more. MyProtein cookies are the first ones I've had that are actually moist, edible and taste great (choc-orange for the win!) Now if I want a sweet treat without the guilt and the "I'll throw in a few extra reps tomorrow", these are definitely on the cards. They aren't rock hard either, so they won't break your teeth like some other cookies on the market and they won't crumble to dust if you leave them in your bag or pack for a while. Highly recommended. Buy with confidence!